Good. 0747560625 ALL BOOKS SHIPPED WITHIN 1 DAY OF PURCHASE! Before Caramelo, Sandra Cisneros was best at the vignette in collections such as House on Mango Street and Woman Hollering Creek. She herself has said that she was influenced by the poetic concision of Jorge Luis Borges' Dreamtigers. Perhaps this novel is evidence of the dangers of the long form. The first one hundred pages or so are very episodic and should've been edited more severely. The author seemed intent on cramming every single memory-detail of the Reyes family's visit to Mexico City, including material that is merely touristic. Part Two begins the Awful Grandmother Soledad's story and it's much stronger: a sustained narrative. There are gorgeous passages on every page, but in this novel Cisneros has a tendency to write catalogues. In addition, there are limitations to the child's voice she employs. With the grandmother's tale, the narrative becomes multivocal--sometimes the grandmother, sometimes the child, sometimes the author. At times the author overexplains, translating virtually all of the Spanish phrases rather than contextualizing them or simply providing a glossary. Having said all that, the reader should enjoy the poetry, the humor, the sheer exuberance, the novel's bursting-with-life quality, and its existence in the world should go a long way toward combatting the persistent and pervasive stereotypes of Mexican Americans and their culture. Sandra Cisneros, in her novel Caramelo, deals with issues of acceptance and alienation experienced by a young Mexican-American girl, Ceyala, as she confronts four separate and distinct cultures: Mexican, Chicano, American, and her own family. Within this personal confrontation, Cisneros skillfully ties in social concerns such as the lack of value placed on human life and the loss of respect for individual craftsmanship that are a result of society?s rush toward disposable, mass-produced commodities. 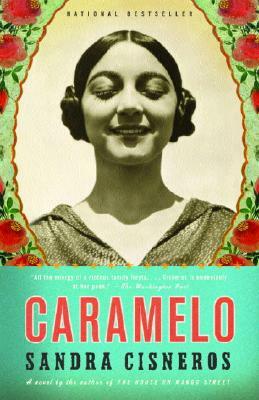 Caramelo is written as a first person narrative through the eyes of Ceyala. On the surface, Ceyala seems to be part of a large, cohesive family. Her father and his two brothers have immigrated to Chicago from Mexico City and work together in the upholstery business. Every summer, the families of the three brothers return to Mexico City to visit the brothers? parents. Appearances, however, can de deceiving. The story begins with Ceyala telling the story of a photograph that hangs over her father?s bed. The entire family is at the beach in Acapulco and is gathered together in a group; one person is missing: ?No one notices I?m [Ceyala] off by myself building sand houses? (4). Thus begins a narrative of isolation and the unraveling of family secrets as Ceyala struggles to find her place in the world. Cisneros artfully crafts a critique of multigenerational communication as the character Ceyala recounts her Awful Grandmother?s history. Through the recounting of the Grandmother?s trials and successes, Ceyala not only comes to realize that her family is a valuable support system, Cisneros? readers recognize the value of history, communication, and multicultural understanding as valuable threads that hold together the patchwork quilt of our society.